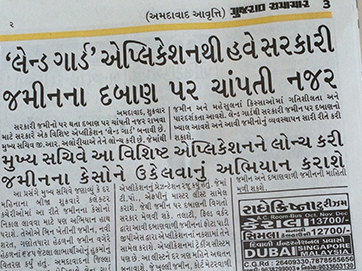 Our application Land Guard got featured on Gujarat Samachar in 12th September 2015 Edition. It was privileged for our company that our application covered by such a leading paper of the Indian State of Gujarat. The application was launched to monitor the government land of Ahmedabad district. Moreover, the application will be used by only Government employees, field officers, senior officers and Ministers of state. The application plays a very vital role in monitoring the government land of Ahmedabad.